An erect annual, occasionally biennial herb (life cycle within 2 years), growing to 1.5m high but commonly 30 to 60 cm, reproducing by seed. 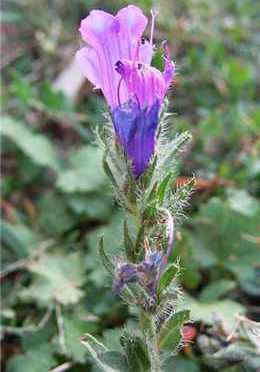 A widespread weed in warm-temperate regions. It is found mostly in areas dominated by winter rainfalls and can flourish in a wide range of soils. As with most weeds, Paterson's curse has become common in degraded pastures, roadsides and neglected areas. Young plants form rosettes with oval leaves. As it grows it produces several stems starting at the base of the plant but can ocassionally be found to be single stemmed. The stems have stout white hairs or bristles. The leaves are alternate and hairy. The rosette leaves can be up to 25cm long, oval to oblong in shape, with distinct lateral veins and joined to the stem via a petiole (stalk of a leaf). The stem leaves are narrower and smaller, sessile (without a petiole) and cordate (heart shaped) at the base. The flower head is curled and unrolls as the flowers open. 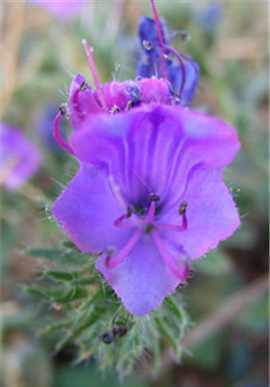 Flowers are 20-30mm long, trumpet shaped and usually blue/purple, though some can be white or pink. 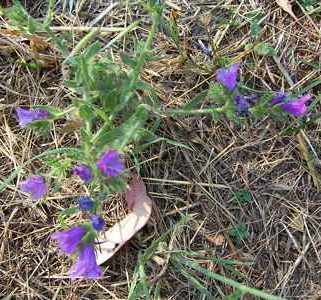 The flowers are sessile (without a stalk) and are attached along one side of the stem. Each flower consists of five petals that are 2 to 3cm long, and 5 stamens with two being longer than the others and projecting significantly from the corolla (the whorl of petals of a flower). The fruit consists of a group of 4 nutlets surrounded by a persistent stiffly bristled calyx (the sepals collectively). The 3-sided seed is 2 to 3mm long, is brown to grey in colour and has marked wrinkles and pitting. Flowering occurs in spring and summer. The stem leaves are cordate (heart shaped with a basal notch) at the base. The rosette leaves of Paterson's curse are stalked, oval and have distinct lateral veins. The inflorescence has two stamens which are longer than the others and they project from the corolla.